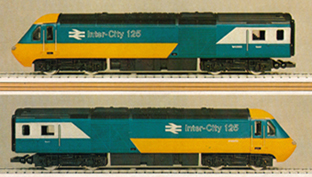 Information: HST Class 253 train sets were introduced on the Western Region in 1975. Subsequent success of design has seen the trains used through-out the Britain and still in use today. A modified XPT design was exported to Australia in 1982. Previously known as Class 253/254. Details: Plans for an advanced passenger train network were introduced by British Railways management in 1970. These plans provided for electric Advanced Passenger Trains to be used through-out the network over the next 20-years. Class 43 High Speed Trains were a stop-gap measure to fill the void prior to the APT units being fully operational. 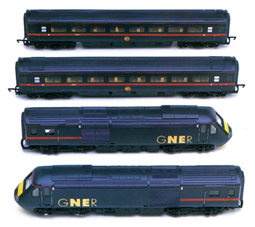 While the APT project failed; the HST met with success never before seen in the history of British Railways. Trial proto-type units were introduced to the public travelling from London Kings Cross to Newcastle along the East Coast mainline on August 2, 1973. The trial run introduced the nation to the idea of to the age of high speed train travel and attained the speed of 125-MPH en-route. The same prototype unit claimed the world speed record for diesel traction by reaching 140-MPH near Thirsk on the ECML on June 11, 1974. Production of prototype units and matching Mk3 coach sets commenced immediately upon introduction of the prototype unit to the Western Region mainline running from Paddington to Bristol on May 5, 1975. A total of 197 locomotives were dispatched from BREL Crewe between 1976 and 1982. The Mk3 coaches were assembled at BREL in Derby. 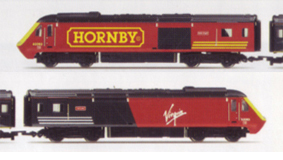 In early years, as individual locomotives went in for maintenance it was decided that retaining the sets made no economic sense as while one unit might be in service the other was automatically made redundant. In addition; success of the design and the failure of the APT project meant the sets would be introduced to other regions. Consequently a decision was made to use only their individual running numbers in the 43 class and abandon matched sets. 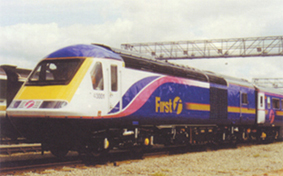 Over the years the HST trains have seen a great variety of colour schemes, from the original corporate blue /grey through the wide variety of colourful private train operator liveries introduced during the 1990’s. Many of these have been superseded or up-dated since introduction. Expected life-span of the units as a stop gap measure was expected to be limited to twenty years. In 2010 many units are still fully operational and going on 35-years of service. Recent mechanical and coach interior refurbishment schemes applied to many units have guaranteed this now historic class of diesels another ten-year life-span. A side note to the success of the design has to include the extensively modified, but externally similar 26-power car units and coach sets built for the province of New South Wales in Australia that were introduced in 1982.